Amber Peterman is an Assistant Research Professor of Public Policy at the University of North Carolina at Chapel Hill and former Research Fellow in the Poverty, Health and Nutrition Division at the International Food Policy Research Institute (IFPRI). She will be co-leading a training session on decision-making indicators with Deanna Olney of IFPRI and Ana Paula de la O Campos of the Food and Agriculture Organization (FAO) of the United Nations at the upcoming A4NH Gender and Nutrition Methods Workshop. On December 2-4, the CGIAR Research Program on Agriculture for Nutrition and Health (A4NH) will host the second annual Gender-Nutrition Methods Workshop, held at Bioversity International in Rome. The theme this year is nutrition and the role of women’s participation in decision-making and control over income. The theme choice reflects earlier agreement that increased control over resources and participation in decision-making by women and other marginalized groups is a key indicator of empowerment, an important outcome to measure in agricultural development research. The workshop aims to help researchers conceptualize and generate high-quality evidence on gender dynamics and decision-making, and to improve the knowledge of gender tools and methods to stimulate further research. However, what do we really know about measuring “decision-making” in poor households and how well these measurements are able to capture the empowerment process within program evaluations? 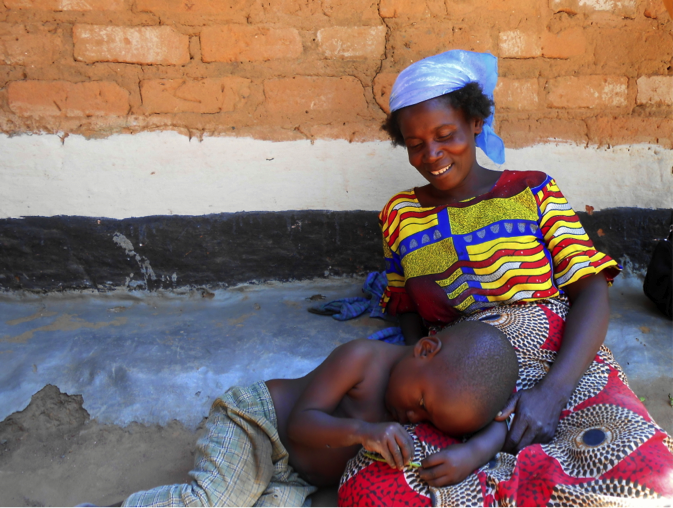 Intra-household decision-making has long been utilized in development research as a method for directly measuring women’s empowerment, and as an alternative to relying on indirect measures such as her age, education or earnings. Although increased decision-making is often collected and analyzed as a potential outcome of any given intervention, it can also be an important moderator at program baseline. For example, initial levels of women’s decision-making may actually increase or decrease the impact of a program, as women may be more or less able to take advantage of the program, or leverage resources for the benefit of their households. A standard set of women’s decision-making variables are now routinely collected in many household level surveys including the Demographic and Health Surveys (DHS). Although variations exist, these questions typically ask “Who in your household usually has the final say” on decisions ranging from child health and education to household purchases—or tailored to agriculture and nutrition such as the decision concerning the types of crops to plant. Responses typically are the respondent herself, her partner, the respondent and partner jointly, or others in the household. Despite a limited number of qualitative studies examining validation of questions, there is scant quantitative research examining robustness of these measures both in survey design and analysis of indicator construction. In fact, decision-making indicators have not been found to correlate consistently with higher socio-economic status, and a recent review from IFPRI has shown that programs such as agricultural interventions or cash transfers show mixed impacts on women’s empowerment indicators (including decision-making). From 2010 to 2012, IFPRI implemented cash and food transfer evaluations in Ecuador, Uganda and Yemen. In each county, variations on the classic decision-making indicators were collected in order to investigate if questionnaire design influenced on our conclusions about how they correlated with socio-economic status and how programs affected women’s empowerment. In all countries, the primary objective of the program was to improve food security and dietary diversity, however in Ecuador and Uganda, transfers were given directly to women, while in Yemen transfers were given to men. As one would imagine, there are variations across decision-making domains and across the three countries. 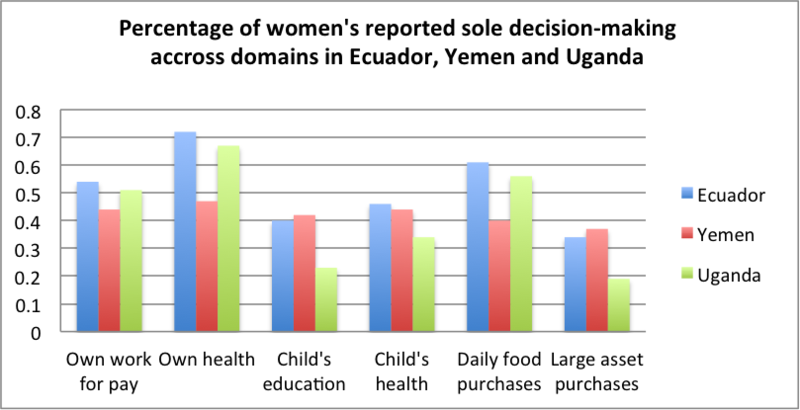 For example, among analyses samples of households where all “standard” domains of decisions are made, in Ecuador, women report making the most sole decisions at 3.2 out of 6 total decisions, followed by 2.5 in both Uganda and Yemen. However, sole decision-making is just one way to measure decisions, and in many contexts, this will be heavily determined by the demographic composition of the household. Therefore, we also construct indicators representing sole or joint decision-making, decision-making after a disagreement, and constructions of women’s reported ideal decision-making within her household. Interestingly, these different constructions result in substantially different relative rankings of households. For example, in Ecuador correlations between indices of decision-making using different constructions range from 0.31 to 0.65—indicating that questionnaire wording and how we assign values to joint decisions make women appear more or less empowered. In addition, we find mixed evidence of the relationship between our decision-making indicators and in-direct measures of empowerment across countries: While variations exist, in general decision-making is correlated with higher age of the woman, however not with education. On the household level, higher decision-making of the woman is correlated with household food consumption and expenditure, however not with dietary diversity measures. Finally, similar to past quantitative evaluations, we find little support that the transfers aimed at increasing household food security also increased decision-making of women, regardless of the indicator construction. The exception is in Yemen, where food transfers result in decision-making across some indicator constructions. We hypothesize that, in a heavily patriarchal setting, food is considered to be one area where women are able to exercise control, while they are not able to do the same for cash. First, it is necessary to ask the right questions, specific to the domain and level of influence one might expect the program to change or depend on for leveraging benefits. Second, it is essential to explore the wording or phrasing of questions which most reflect the program goals—particularly in local languages, which often have limited vocabulary for nuances. Formative research is particularly helpful for both these points when studying a new context with different cultural and gender norms. Third, it is important to include or give a full set of response options which reflect possible decision-making arrangements, and to explore what these mean in the study setting. We should not simply assume that sole decision-making is preferable to joint decision-making, depending on household structure and power dimensions within the household. Fourth, qualitative triangulation of evidence as well as exploration may be necessary to uncover certain domains of empowerment, not able to be captured with quantitative survey methods. Finally, we as a research community need to continue advancing the frontier of how to most accurately capture and analyze decision-making and women’s empowerment. Stay tuned for an update to this post with a link to presentations (both slides and video recordings) from the upcoming workshop, as well as forthcoming papers on women’s empowerment in IFPRI’s discussion paper series. Doss, C. 2013. Intrahousehold Bargaining and Resource Allocation in Developing Countries. World Bank Research Observer, 28(1). Heckert J and MS Fabric. 2013. Improving Data Concerning Women’s Empowerment in Sub-Saharan Africa. Studies in Family Planning, 44(3): 319-344. Malhortra A, Schuler SR and C Boender. 2002. Measuring Women’s Empowerment as a Variable in International Development. Background paper prepared for the World Bank Workshop on Poverty and Gender: New Perspectives.